Stitching heaven & earth. Sock knitting - one at a time or two. Thoughts, joys, fears, prayers. Favorite knitting books. From our home in the rural foothills of the White Mountains. I just started knitting this pair of socks this evening which in a nutshell is just your classic sock pattern. Old Norwegian cast-on which is nice and elastic which is what you want for socks that you'll be pulling on and off and over your heal. I'm not sure is you can tell by the photo, but I'm working an embossed moss stitch ribbing instead of the usual k1 p1. I'm knitting the socks on one long set of size 4 Addi Turbo circular needles in what nowadays is called the magic loop method although I've been knitting this way for as long as I can remember. The Peer Gynt is made in Norway, is 100-percent wool, and is wonderful to work with. It's a light worsted weight, so while the finished socks will be somewht heavy and very warm, they'd be far too heavy if I knitted the entire leg and instep in the embossed moss pattern - okay if I wanted the socks as slippers, but I don't and want to wear them with my Crocs, so I don't want the added bulk with this weight yarn. Work on a multiple of 6 stitches. In my case and for a woman's size medium, I cast on 48 stitches. Round 1: *K1, p1, k2, p2, repeat from *. Round 2: *K2, p1, k1, p2, repeat from *. ...in today's mail delivery was a book, an event that can turn the bleakest day into a celebration, and particularly today since the book I had anxiously waited to arrive was SIMPLE SOCKS Plain and Fancy by Priscilla A. Gibson-Roberts. Here's a picture-link. Is anyone out there??? I need HELP!! I signed up to be included in a knitting webring, and while I was approved, I cannot be included in the webring until I can get their banner up on my blog. I've tried doing this, and each time, their banner comes out messed up and without the picture of the sheep on the banner. I have tried over and over and over. I copy their html and place as I should, and each time, this happens. I don't know what else to do. I am at my wit's end! Am I doing something wrong? And is there some other way to do this? Be careful what you wish for...and who you knit for!! rosary, a mantra, chanting monks. Excerpt from poem, "Knitting", by Cris Carusi in the book, THE KNITTING WAY: A Guide to Spiritual Self Discovery by Linda Skolnik, founder of Patternworks in Center Harbor, NH, and Janice MacDaniels. "Listen to the music of knitting. The knitting melody flows, carrying each one of us along a river of connection. Find the kind of music it is for you. It doesn't really matter what kind of music. Just let it speak to you and open your soul to wonders. "Hear the wind, the sea, and the rolling hills. Listen to the sky. Let your hands dance with the wool. Your fingers see the sheep on the green hills. The smell of the earth that produced the grass that fed the sheep who gave their fleece lies in the wool. The sound is in the wool. Hear the waves, the sea air, the salt spray that nurtured the wild sheep in the Shetlands and Hebrides. The harmoney is found there. It calls us to remember and reach for the comfort of the work of our hands. "Knitting connects us to all who have gone before. It links us to the past, to those who knitted for their existence, who knitted for survival, who knitted for beauty and love. It links us to our own past. We can know our ancestors who knitted. We can experience3 their past in our fingers. A knitting great-grandmother is still in our fingers. The orchestra connects us, not just by blood and DNA but by the stitch. A grand concert of beauty, history, earth, and sky lies in the work of our hands. Knitting has melody, harmony, and rhythm. Hear it. It is music. Listen." Excerpt, page 7. 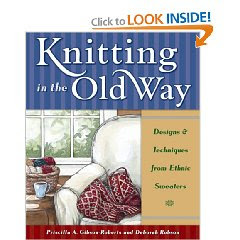 I am currently reading THE KNITTING WAY. I had been knitting a beautiful soft rose-colored prayer shawl to give as a gift for my husband's mother, a woman who had never been nice or shown the least little bit of kindness to me in all the years of our marriage, and as I neared the completion of the shawl and was working on the pretty scalloped edging, I realized that while I was knitting, my thoughts were on her and how my mind had revisited every sharp-tongued word and misdeed I'd had to silently endure. It were as though she were here, living in my home and finding fault in each repetative loop and stitch and speaking her harsh words with each pattern and row. I suddenly realized I was extremely stressed, and my stomach was knotted worse than a messed-up and completely hopeless skein of yarn. By making the prayer shawl for her, I'd allowed her into my home and my heart where she wasn't using me gently. With the edging half done and the shawl nearly finished, I had to put the knitting down and try to find a measure of peace and relief. I turned to my library of books and was looking at various titles when I came to this book which caught my eye with the word spiritual in its title. Yes, I needed spiritual, I needed my heart and my soul to be comforted and mend after the week or so working on the prayer shawl, all the while somehow allowing my husband's mother an extended visit which I should have known she would use to again kick me in the head and the heart. What started out a joy turned into my own little hell, recalling her harsh words with each stitch and unable to move away from it. I felt as though I were dying. It's been a few days now, and I still haven't been able to pick up the knitting. But I'm finding the book is helping shore me back up, guiding me back to inner balance and peace. A painter friend's husband just passed away suddenly. The new widow is in her late 50s, talented, gracious, lovely, and kind. With her pretty dark hair and eyes, she'd looked lovely in the prayer shawl. And for me, it would bring the joy back. My husband's mother likes hard candy and who knows if she'd like the prayer shawl at all, but I'm fairly certain she'd find something - the color all wrong, why didn't I knit her a sweater instead, that I had time on my hands, as she says, it to make it at all. Here I am with a tiny red "sock blocker" sock on the needles, little Christmas gifts for two special people. The yarn I'm using is "100% Pure new Norwegian Wool", made in Norway by Dale of Norway - HEILO...I just LOVE this stuff - sooo nice! :-) I'm not following the directions completely, and instead of size 0 needles I'm using my size 2 Addi Turbos and knitting them utilizing the Magic Loop method, so I have had to make some little changes and adjustments here and there. Not hard, and the finished socks are just too cute!! 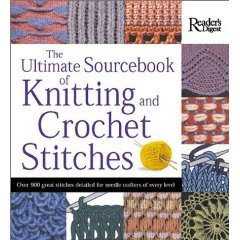 Back when I was in a master knitter program, a few certain books were referred to and recommended again and again. Here are 3 of those books that I have found invaluable over the years and refer to often...and as usual, with links so you can actually FIND them. 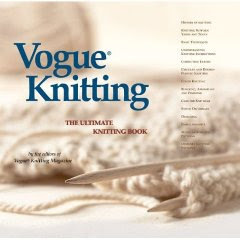 VOGUE KNITTING - The Ultimate Knitting Book. From the history of knitting to the details of constructing a sleeve cap, there has never been a knitting book as complete, as lavish, as easy to use and understand as Vogue Knitting - The Ultimate Knitting Book. Whether you are making cozy sweaters, homey decorations, or personalized gifts, THE ULTIMATE SOURCEBOOK OF KNITTING AND CROCHET STITCHES will help you design everything from simple scarves t intricate lacework. With these tried and tested stitches along with your own imagination, there's no limit to what you can create. KNITTING IN THE OLD WAY represents many lifetimes of knowledge, beginning with the contributions of the knitters who invented the craft out of necessity and an adventurous spirit. They and those who followed them have wrought marvels with exquisitely simple tools and materials. :-) These little cuties are my own copyrighted designs which I conceived of and started making entirely by hand several years ago. I sign and date each pair and they are highly unique and collectible. Since I size them in the 10 to 12 or so range, I use and recommend them primarily for knitting that will be felted. I make them your choice of 10 or 12 inches long. Seven to ten years ago I was selling these and my other Nordic designs for $65/pair, but because I was so swamped with orders, I actually had to stop making them as these old hands can only work just so fast. I now sell them for $75/pair and take occasional orders with a 2-set $150 minimum order (they're made entirely by hand and handpainted in several stages, and because of the amount of work involved, I don't take single-pair orders anymore - sorry!) plus $9 shipping to US addresses - a nice gift for the knitter on your list who thinks she has everything :-). If you'd like to special order, email me and please type NORDIC KIDS KNITTING NEEDLES in the subject line. I learned to knit as a small girl and have been knitting ever since. I live by a lake on 40-acres in northern rural New Hampshire. Besides knitting, I garden, paint, quilt, and have a small flock of hens for their large brown organic eggs. With Kindle, I get to take my entire library of books with me wherever I go! :-) Check it out! !